BLISS spreads across Lalo’s face as his glossy black locks are blown dry by cooing stylists. Dogs big and small are beautified for 100 pesos ($7.70) in the back of a perspex-walled van run by Fluffy Shower, a mobile pet-salon that visits Mexico City’s posh neighbourhoods to apply shampoo and ribbons to upper-class animals. The sharpest dogs sport green, white and red jerseys to mark Independence Day on September 16th. Next month pet boutiques will sell Halloween pumpkin outfits and dainty witches’ hats. Pet care is booming in emerging markets, as the growing middle class stops buying dogs for security (or dinner) and starts doting on them. Nowhere has the fashion taken off as quickly as in Latin America. In the past five years spending on pet food and knick-knacks has risen by 44%, to $11 billion, according to Euromonitor, a market-research firm, which estimates that Chile has more pet dogs per person than any other country. 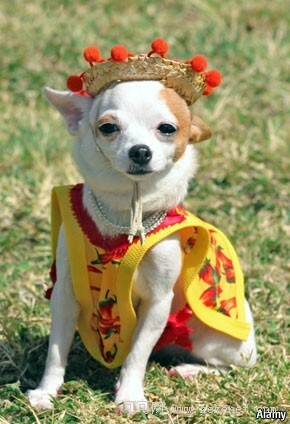 Latin pets may be the world’s most fashionable. As Mexico’s rainy season tails off, dogs are stepping out of designer shoes to show off painted claws. Rising incomes allow Latinos to treat mutts as members of the family. More young people are living alone and putting off marriage, choosing pets for company instead. These “pet parents” indulge their animals as if they were children, says Emily Woon, Euromonitor’s pet-care supremo, who reports that Latin America has been the “star market” of recent years. Latinos are especially fond of dogs, which are costlier than cats, but superior in every respect. Whereas in Europe the dog- and cat-food markets are equal, in Latin America dog food outsells cat food by nearly six to one. There is room for growth. Many Latinos still feed their pets table scraps: three-quarters of Mexican hounds make do with leftover bits of burrito. Billboards around Mexico City’s parks urge owners to switch to Pedigree and other brands of delicious packaged pet food. Glitzy pet superstores, which account for more than a fifth of pet-product sales in America and Canada, barely exist south of the Rio Grande. The most popular outlets are still small, independent pet shops, which retain customers by offering credit. But the superstores will come. And when Latin animal-lovers can buy a full range of food, toys and veterinary services in one place, life could become even more luxurious for Mexico’s privileged pets.